Patients in Swansea who are mobile and require ongoing intravenous antibiotics can now receive their treatment via a nurse-led community clinic. Patients in Swansea who are mobile and require ongoing intravenous (IV) antibiotics can now receive their treatment via a nurse-led community clinic. The hospital-based clinic is the brainchild of Swansea’s community-based acute clinical team (ACT). The ACTs are 45 staff including advanced nurse practitioners (ANPs), sisters, qualified nurses, a consultant, GPs and healthcare support workers. 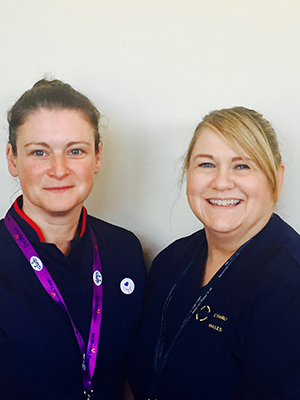 They provide a rapid response service to treat acutely unwell people at home and over the past two years, the team has been providing an IV antibiotic service in patients’ homes to enable earlier hospital discharge. One of the main catalysts for the introduction of the IV antibiotic service in a nurse-led clinic setting was to cut back on the amount of time the nurses spent travelling between IV antibiotic home appointments. 'We cover Swansea from our base and were often spending more time on the road than with patients,' says Abertawe Bro Morgannwg University Health Board ANP and ACT lead Sarah Davies. Mark Ford makes the journey to the community hospital from his home in West Cross (four miles from Swansea) where he was originally treated following a hospital stay in May. Mr Ford developed pneumonia which caused the wound he received when he severed his aorta 18 years ago in a car accident to reopen, and left him with a hole in his lung. He was allowed home a week after surgery. Without the community IV antibiotic service, he would have been required to remain in hospital for three months. Patients who are frail or housebound will continue to receive IV antibiotic therapy at home. For those that are generally well and have no problem getting to Gorseinon Hospital, the clinic offers a more convenient treatment solution. IV antibiotic treatment can be required for a range of conditions including spinal abscesses, pancreatitis, joint infections and infections that develop following heart procedures. The clinic opened in June and runs from 8am to 4pm, seven days a week. 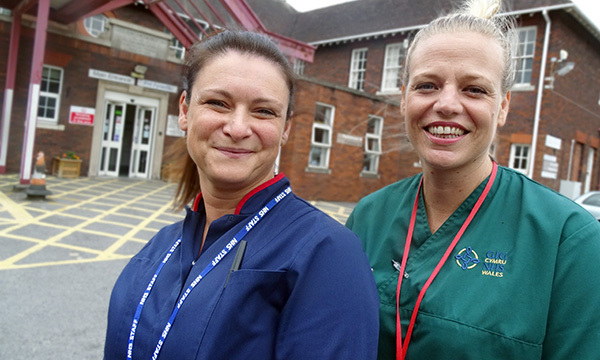 It is nurse-led with community nurses, sisters and ANPs all providing cover on a rota basis. The team currently has five ANPs and a further three nurses have almost completed their ANP training. The ANPs cover one clinic a week and carry out patient reviews. As the clinic is still relatively new, one nurse covers the clinic each day along with a healthcare support worker. The clinic currently treats approximately ten patients per day. 'That one nurse can see the same number of patients in the clinic that maybe four nurses would have seen previously,' adds Ms Davies. 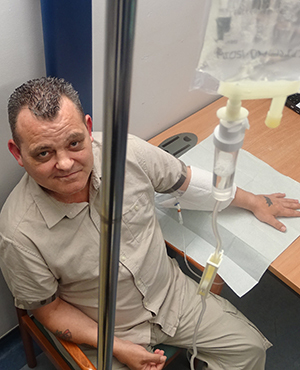 The clinic also offers a unique service in the community which would previously only have been available at the acute hospital – longer IV infusions. The nurses are limited to 30-minute IV home treatment windows due to the time they need to spend with patients before and after treatment. 'We have had to say no to requests for patients to have IV antibiotic infusions that would take over 30 minutes in the past,' says Ms Davies. Ms Davies plans to improve the range of care offered in the clinic setting by progressing the ANP skillset. The advanced nurses are currently receiving training from the acute hospital’s vascular access team on inserting midline catheters. Most patients are seen on a once daily basis at the clinic, but those who require IV antibiotics twice a day are also catered for by the service. 'Twice daily patients tend to receive a morning dose at the clinic and an evening dose at home,' says Ms Davies. Gorseinon Hospital provides a better environment for patients and they are assured of being seen in their allotted appointment time, Ms Davies adds. The ACT and community hospital are keen to increase opportunities for further integrated working. Gorseinon Hospital has a 44-bed assessment and rehabilitation ward and the community ACT hopes to prevent acute admissions for the ward’s older patients via its hospital-based clinic. Another idea is to share skills between the ACT nurses and the community hospital’s nurses to benefit patients in the community. 'Patients like coming to the clinic, whether young or old,' says community ACT sister Sharon Davies. 'The younger ones tend to go for early appointments so they can have the rest of the day to themselves. Older patients who are mobile like coming to the clinic as it gives them a sense of routine and gets them out and about in the community. The community hospital is situated on a bus route so it is easily accessible. 'I find working in the clinic is particularly satisfying as patients are grateful they can receive their IV treatment here. The clinic has enabled some patients to be discharged from hospital sooner. 'We are also able to treat more patients in the clinic. If I was providing IV therapy in the home, the most I would be able to do per day is two or three. Here, I can treat ten patients a day more. At the end of clinic, you feel relaxed and satisfied as you have not been worrying about lack of time or upsetting patients if you are running late.